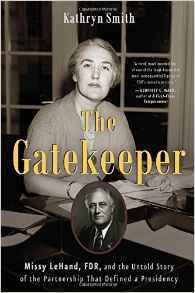 The Gatekeeper by Kathryn Smith shares the life story of Marguerite (Missy) LeHand personal secretary to President Franklin D. Roosevelt. She gained family access to her personal papers, work correspondents, newspaper interviews done during her life time and much more. Smith shares this story less like a biography and more like a novel. At different points she even reveals connections between LeHand’s and FDR’s early life although the two future friends and allies did not meet for years. The book gave me the impression that LeHand’s and FDR meeting had to happen. Yet in reality the two only met briefly before Charles McCarthy (FDR’s secretary in 1917) hired her on for clerical work at the Department of the Navy’s Ordnance Board. Not till three years later, after McCarthy by now impressed with LeHand’s work, asks her to join FDR’s Vice Presidential campaign in 1920 as a secretary, did the seeds of LeHand and FDR’s future bond began. When they did connect, as Smith wrote an instant bond formed going beyond the gaining of strength from personal illness. FDR grew strong from his fight against polio and LeHand from the rheumatic fever that damaged her heart, each battle fueled who they became and what they did in the future. Ultimately Smith’s book adds another layer to the FDR story through a member of his inner circle. LeHand is a remarkable woman who like few other women in FDR’s life, helped to shape his political and world views. She also put many cracks in the barriers facing women of her day.